This 1000Base-ZX SFP module delivers what you need most in your network connections: reliable performance. Itâ€™s built to exacting MSA specifications and fully tested to ensure seamless compatibility. 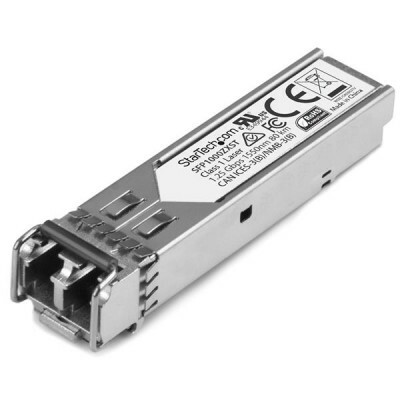 The single-mode SFP transceiver module offers a cost-effective way to add, replace or upgrade the ports on your networking equipment, and itâ€™s backed by a lifetime warranty. With data transfer rates of up to 1Gbps and support for Digital Diagnostics Monitoring (DDM / DOM), this LC SFP module can be installed into fiber networking equipment with an MSA compliant port. It delivers dependable Gigabit connectivity over single-mode fiber for 1000Base-ZX compliant networks, with a maximum distance of up to 80 km (49.7 mi.) and 1550 nm optical wavelength. This optical transceiver is engineered to meet or exceed the industryâ€™s MSA (Multi-Source Agreement) standards. StarTech.com brings its established reputation for high-quality connectivity solutions to SFP transceivers, providing SFPs that match major OEM brands in performance and reliability. Committed to the highest standards, StarTech.com provides an extensive range of networking products including copper and fiber network cards, fiber media converters, Ethernet switches and wireless products. Delivering both convenience and scalability, this fiber transceiver is fully hot-pluggable, which enables you to install it without interrupting network traffic or having to reboot your equipment. It provides a versatile solution thatâ€™s compatible with a wide range of networking equipment, allowing you to expand your network to remote segments cost-effectively. You can count on SFP1000ZXST for reliable performance, backed by a lifetime warranty and free lifetime technical support.